A U.S. district court has ruled that KFC must face a lawsuit accusing the company of failing to honor coupons for free "Kentucky Grilled Chicken" meals that were heavily promoted on the Oprah Winfrey show. 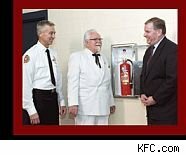 U.S. District Judge James F. Holderman in Chicago rejected a request by KFC and its Louisville, Kentucky-based parent, Yum! Brands Inc., to dismiss four lawsuits filed last year accusing them of breach of contract, common law fraud, and violations of the consumer protection laws in Illinois, Michigan, and California. The plaintiffs, Judge Holderman ruled, "state a plausible claim for common law fraud." KFC introduced the new meal in April 2009, which was touted as a healthy, fast-food alternative. Oprah Winfrey announced a nationwide giveaway on her show in May of that year, directing consumers to her and KFC's websites to download coupons for a free Kentucky Grilled Chicken meal, which included two pieces of chicken, two sides and a biscuit. Although consumers printed some 10.2 million coupons, only 4.5 million were actually redeemed. KFC, the suit charges, "began almost immediately to refuse to honor the coupons," and "stopped the promotion altogether on May 7, 2009 - two days after it was announced," advising customers to apply for an online rain check instead. Before canceling the promotion, the suit alleges KFC restaurants limited free meals to the first 100 coupons per day, with many outlets continuing to sell them after refusing to honor any more coupons. The suit also says Kentucky Grilled Chicken contains rendered beef fat and beef powder, which it claims is not disclosed in marketing materials. KFC says it was simply unable to keep up with the tremendous demand for its free meal promotion. "We provided millions of free Kentucky Grilled Chicken meals around the country when the offer was announced in 2009," said KFC spokesman Rick Maynard in an e-mailed statement. "Due to the overwhelming response, we distributed millions of rain check coupons for the holders of valid coupons who we were unable to serve during the offer period." Although KFC and Yum! asserted the rain check offer satisfied any alleged breach of contract, Judge Holderman dismissed that argument. "Based on the allegations of the Master Complaint, the court finds it plausible that Defendants never intended to honor the coupon as represented," Holderman wrote, pointing out that by promoting the free meals on the highly-rated Oprah show, KFC and Yum! must have expected millions of consumers to respond -- and to have considered what would happen if individual KFC outlets ran out of the advertised product. "With these considerations in mind, the court finds that it is plausible Defendants intended all along to offer a 'rain check' in place of the coupon, or otherwise limit redemption of the coupon beyond the terms stated on its face," Holderman added. The plaintiffs allege violations of consumer protection laws in Illinois, Michigan and California, and are seeking compensatory and punitive damages of at least $25 million, slightly more than the value of the 5.7 million unredeemed coupons for the $3.99 grilled chicken meals. The ruling, In Re Kentucky Grilled Chicken Coupon Marketing and Sales Practices Litigation, No. 09 C 7670 , was filed on July 8 in the Northern District of Illinois.